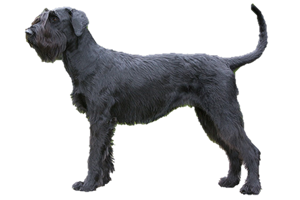 The Giant Schnauzer is one of three Schnauzer breeds that originated in Germany, the other two being the Standard and Miniature. Their original function was cattle drover, although they have also worked as property guards and police dogs. Dogs resembling today’s Giant Schnauzer have existed in the Bavarian highlands since at least the 1800s. Cattlemen crossed the original Schnauzer with larger breeds that probably included the Great Dane, Rottweiler, Bouvier des Flandres and local sheepdogs in order to create a stronger cattle drover. Is the Giant Schnauzer Right for You?